Accessibility matters because we, the people, want to use the web. Working towards an inclusive web helps us achieve that goal. In this article I’ll share my thoughts on why accessibility is important; from empathy and what is simply “good business”, through to selfishness and accessibility laws. Let that sink in for a while. I can’t think of better way to summarize the inclusive web (and I suggest you read all Andrea’s brilliant articles about accessibility after this one). In other words, everyone should be able to browse, navigate, and interact with the web using any device they might have. Note that I haven’t yet mentioned users with disabilities. It’s true that different types of disabilities play a big role in web accessibility, but everybody can have special needs. We are all different and our needs can change over time. Let’s look at some examples of diversity. Many things can affect how we use the web. Here are a couple of mini-stories about different kinds of people and how they might struggle using the web. My parents’ eyesight isn’t that great anymore. Both have worn glasses for years, but that’s not the only problem. The real issue is their crappy old monitor. With their eyesight it’s impossible to see text if there isn’t enough contrast between background and text color. They also struggle to use more complex sites or fill out the forms. This may be because websites and forms can be too complex, but they definitely want to use online services just like me. We’re celebrating accessibility! Not really, more like 100-year-old Finland. My friend’s wife has Usher syndrome, type three. She has narrow sight, which means that “busy” sites are problematic for her. She finds it difficult to navigate and locate the actual content when there is lots happening on the page. For her needs, the simpler the better. Good color contrast helps significantly when reading the text and underlining the links helps identify them within text. Form submit buttons are difficult to find if they only have thin borders with a transparent background, and the same goes with form fields if they don’t have clear separation from the background. She also informs me that ads in amongst the content are confusing. I couldn’t agree more. A couple of years ago my friend was in a car accident and broke bones in both his hands. For a guitar player it was a shock. But almost as big a shock was in realizing he would struggle to use his laptop and phone while recovering from the accident. He started to use keyboard commands on his laptop, and voice commands on his smartphone. However, many websites he wanted to use were not accessible via the keyboard only. Even small tasks could take hours. My first personal experience of accessibility was a student of mine who had a low vision. She wasn’t completely blind, but she had to use a magnifier to read. She also used a screen reader for navigating the web, but most sites were easier to use with her magic magnifier. Sometimes she couldn’t find or open the navigation. Sometimes the wall of text, long paragraphs without headings or lists were too much for her. But she came to terms with the barriers. “I’m just going to find another, better website”, she often noted. They have dyslexia or other reading difficulties. Content is not written very well. Writing more accessible content can be a solution for this. Content is not in their native language. Multilingual sites help get information. They try to multitask. Simple and clear user interfaces help them keep focus. It’s almost certain that some of my friends are color blind. Heck, even I could have some sort of color blindness. Color blindness is that common. Imagine that links are not underlined in your main content, but instead rely on a different color. How would you distinguish them if you experienced some kind of color blindness? It should go without saying that people who are deaf, or hard of hearing, benefit from captions on video, or a transcript of audio. But how many times have you also needed captions? Perhaps the spoken language is not your native language, and you understand it better when written. Even better if translated. Maybe you can’t hear the audio, because your environment is too noisy. Or you can’t turn on the sound because your better half is already sleeping next to you. Where are those headphones when you need them? Captions may even have helped you find video content on the web; search engines love textual content too. I Love Working by the Sea! I recently tried working by the sea. I imagined a beautiful, idillic environment would do wonders for my productivity. How wrong I was. The Wi-Fi was awful and my screen didn’t like the sunlight one bit. A couple of beers later and I was done doing work. Sigh. If empathy for these situations hasn’t yet convinced you, there are other concrete reasons why inclusive web design is important. 20% of people rely on an inclusive web and accessibility, otherwise they would not be able to use your product at all. 50% of people benefit from an inclusive web and accessibility. Everyone benefits from a website being usable. According to Jonathan Hassell’s book Including your missing 20%, these estimates are pretty accurate. He uses the United Kingdom as an example. Total population of the UK: 62,2 million. Total number of disabled people in the UK: 11 million (approximately 18% of the population). About 7 million people have a physical impairment, of whom 2.5 million have difficulties using their hands which may impede their use of computer keyboards and more. 2.2 million people have difficulty with memory, concentration or learning, of whom about 1 million have learning difficulties. 2.1 million people have some form of communication difficulties. Almost 2 million people have a hearing impairment which is disruptive to their life style, of whom 20.000 use British Sign Language to communicate. Approximately 2 million people are dyslexic. 1.8 million people have a vision impairment which is disruptive to their lifestyle, ranging from those who may have difficulty reading text without it being enlarged through to those who may need to zoom the display of their computer up to 16 or 32 times. 8% of all men and 0.4 % of all women are colour blind. 180,000 are registered severely sight impaired (blind). Over 1 million people have a progressive, cyclical or fluctuating condition such as multiple sclerosis. Over 1 million people have mental health conditions, most of whom are unlikely to find it affects their use of the internet. Usability and accessibility walk hand in hand and both share the same goal: that the website or app is easy to use for everyone. Intuitive design: users quickly understand the site structure and navigation. Ease of learning: users quickly understand what the site is about and complete the main tasks of the site. Efficiency of use: tasks are fast to complete. Memorability: users can easily do the same tasks again when they come back. Error frequency and severity: do users make errors while navigating the site, are errors severe or not? Subjective satisfaction: users like your website! These are perfectly aligned with accessibility and inclusive web design ideas. Karl Groves’ article Accessibility & SEO myth has a valid point in that SEO use cases account for only a small fraction of accessibility. It’s true that accessibility doesn’t lead to better SEO automatically, but even the small fraction of overlapping is good to keep in mind. Are you still not convinced about accessibility being a natural part of web and digital products? Would you hop on board if creating accessible websites and digital products were required by law? Well, it is required by law in many countries. I don’t know about your country (please leave a comment and let us know) but in the European Union (EU) there is directive on making the websites and mobile apps of public sector bodies more accessible. It was approved on 22 December, 2016. Note that this directive addresses public sector websites specifically. But don’t let that detail deter you. You can include accessibility in all your work. Websites that are published after 23 September 2018 must be accessible by 23 September 2019. Websites that are published before 23 September 2018 must be accessible by 23 September, 2020. Mobile apps must be accessible by 23 June 2021. Extranets and intranets that are published before 23 September 2019 must be accessible when they are redone. Quick reference of WCAG translates the meaning of these guidelines in more detail and in a more understandable way. Understanding WCAG 2.0 is an even better summary. Note that WCAG version 2.1 is being released while I’m writing this. Also web accessibility in EU and European Accessibility Act pages have more useful information. In the US, accessibility laws are referred to under section 508. Paciello Group have a good overview of updates on section 508 law. I encourage you to find out what accessibility laws your country have. “Hey, let’s build that bridge for everyone. Not just for our Ferraris”. The people of the world would like that very much. But this is not a one person show; it needs everybody in your company or organization to get involved. Accessibility is a shift in mindset of your entire company. It’s not just a checklist for what you have to do within your role. In an ideal world we would all want to build a usable, accessible, inclusive, and better web for everyone. 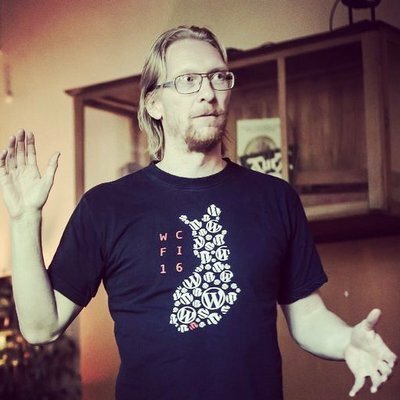 Teacher and front-end dev, who likes to learn about web, accessibility and WordPress. I run a theme and plugin shop called Foxland.